My answer was yes we can and here’s how we did it. 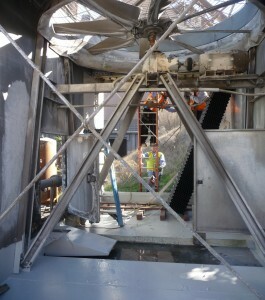 The cooling tower worked in a harsh environment providing process chill water that was operating 24/7. The only shutdown was about 10 days during January. Here’s what the tower looked like. Calcification had taken over metal assemblies during it’s time at the plant interfering with belt adjusters, distribution trays, air seals, cold water make up and surface media. Cooling efficiency dramatically dropped. The customer was using fresh make-up water to lower temperature of the outgoing water to the process equipment. This tower wasted water, energy and chemicals in order to service the equipment. Fortunately, the tower was not located where an LD bloom could infect workers; however, towers in this condition have become ground zero for legionella blooms. The customer made the decision to go ahead. We were given five days to demo, clean, prep and reassemble the retrofitted tower. The pictures tell the story better than I can. Our marine grade epoxy does not require media blasting saving metal. Our technicians are trained to also seal holds and seams during the preparation. 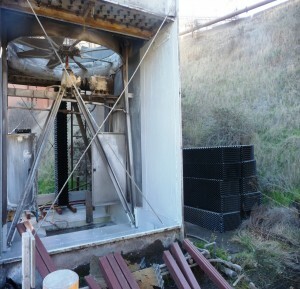 We epoxied the reservoir, side walls, fan supports and distribution trays on this project. Once painted, the epoxy is ready for water within 5 to 7 hours depending upon the weather. WSC techs fabricated a foundation using recycled plastic wood designed to remain under water for 25 years. The foundation supports the fill bundles to insure that water flows through packing freely as it flows underneath the packing bundles. We installed heavy duty packing bundles (15 mil) and integrated louver bundles with a six inch integrated louver for air intake to withstand the harsh environment of the location. We also installed integrated drift eliminators to keep the fan from sucking the water out before it reached the bottom. 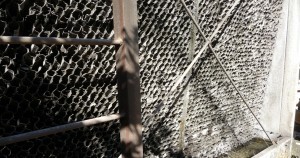 The remaining surface fill is a herringbone design to cross flow the returned water with air that is being drawn in by the fan. The tower was ready to return to service after 4 and ½ days. The water flow was distributed more evenly across the media separating heat from the return water. Rusted walls were sealed allowing chemicals for reach every corner of the tower. The retrofits made the tower more efficient thereby saving energy and using less water. The tower’s economic life was extended several more years. Inquire today to see if we can repair your tower.